View some exciting prints & full size canvas reproductions ....plus affordable originals! The common thread amongst all of these paintings is the Rolls Royce Merlin 27 Litre V-12 engine. Listen to that characteristic sound, both a growl and music to the ears, hear the engine cough when the aeroplane is inverted, as Rolls Royce relied upon carburettor fuel systems as opposed to the increased usage of fuel injection by German engines in WW2. Imagine the sounds as you pause over these paintings, all linked by magnificence. Trevor Lay is available for any specialist commission. Scroll down to see some superb paintings of Avro Lancasters, Vickers Supermarine Spitfires, and Hawker Hurricanes. Print size 20" x 24"
yew, moulding with gold sight edge. Flight Lieutenant John Oliver Lancaster D.F.C., 40 & 12 Sqd. John Lancaster took part in the first 1000 bomber raid on Cologne, and flew 54 missions throughout the war. After the war he became a test pilot with Saunders Roe and flew the SRA 1 jet flying boat. In 1949 he joined Armstrong Whitworth and test flew the AW 52 "flying wing" . On 30th May 1949, he became the first pilot to eject from an aeroplane "in anger" using a Martin Baker ejector seat, as he rapidly departed an AW 52! Retiring from a flying career in 1984 John Lancaster had amassed over 13000 hours flying 148 different types across a period of 47 years. Flight Lieutenant Alan Biffin 57 Sqd. Alan Biffin flew 19 missions, his last saw him crashing into the North Sea having caught a burst of flak returning home over the Dutch coast. He was picked up by an Air Sea rescue launch but had broken both ankles in ditching into the sea. Squadron Leader Malcolm "Mac" Hamilton D.F.C. * 619 & 617 Sqd. "Mac" Hamilton joined 617 under the command of Leonard Cheshire, and was given Guy Gibson's old AJ-G aircraft from the Dams raid to practice with! Amongst many targets were the Saumur Tunnel, the Dortmund-Ems canal and the Tirpitz. Wing Commander Ernest Rodley D.F.C. * A.F.C. D.S.O. 97 & 128 Sqd. Ernest Rodley flew Manchesters in late 1941 and attacked the Scharnhorst, Prinz Eugen and Gneisenau whilst in Brest harbour. 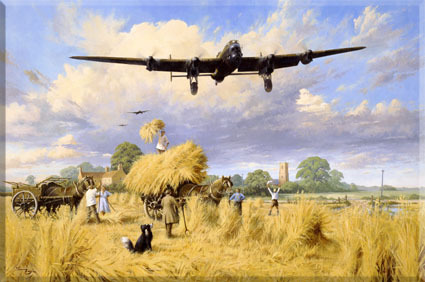 Perhaps his real baptism of fire, and certainly for the Lancaster was the infamous and daring low level Augsburg Raid 17th April 1942 with 6 Lancasters from 44 Sqd based at Waddington and six from 97 Sqd based at Woodhall Spa. The raid is legendary, with a V.C. being won by Nettleton of 44 Sqd. 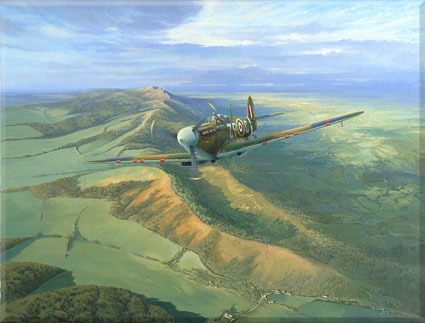 He later took part in the famous Peenemunde raid 17th August 1943. In February 1945 he joined 128 Sqd at Wyton and did 7 trips to Berlin in Mosquitoes. In 1946 he joined British South American Airways flying Lancastrians across the Atlantic from a tented Heathrow. On 13th April 1950 he was checked out on the revolutionary Comet jet airliner by John Cunningham and became the world's first jet endorsed Airline Transport Pilot's Licence holder, but only because he raced his colleague to the Air Ministry getting there first as he had a faster car...an Aston Martin! He retired from BOAC in 1968 as a Boeing 707 Captain, joining Olympic Airways 3 days later. He amassed an amazing 28000 flying hours! Group Captain James "Willie" Tait D.S.O. *** D.F.C. * 10, 35, 78 & 617 Sqd. "Willie" Tait had a highly distinguished R.A.F. career that began in 1936 lasting until his retirement. He flew Handley Page Heyfords then Whitleys with 10 Squadron. He flew Whitleys to Berlin in 1940. He joined 35 Squadron in February 1942 which was the first Squadron to accept the new Halifax bomber. He took command of 78 Squadron in July 1942. He is best remembered for his exploits with 617 Squadron and the bombing of the Tirpitz which 617 and 9 Squadrons sunk on 12th November 1944. By the end of the war he had flown over 100 sorties. M.R.A.F. Sir Michael Beetham D.F.C. A.F.C. G.C.B. C.B.E. 57, 50 & 214 (post war) Sqd. 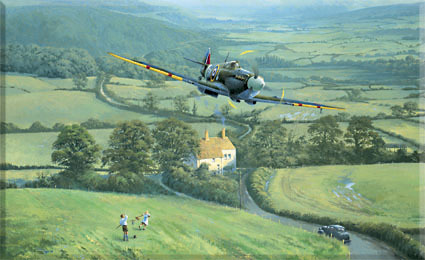 As a boy Michael Beetham saw the Battle of Britain unfold during his school holidays. This inspired him and he enlisted at 18 in May 1941. His first operational tour was with 50 Squadron during the winter of 1943/44. He joined 57 Squadron just as the war was finishing. Highlights of his post war career included the command of 214 Squadron flying Vickers Valiants from Marham, command of R.A.F. Khomaksar, Aden, Commandant of the R.A.F. Staff College, C in C R.A.F. Germany and 2nd T.A.F., culminating in more than 5 years as Chief of the Air Staff. Sir Michael Beetham is the President of the Bomber Command Association. Squadron Leader Tony Iveson D.F.C. 616, 92 & 617 Sqd. Tony Iveson joined 616 Squadron at Kenley on September 2nd 1940 flying Spitfires, joining 92 Squadron a month later. He was commissioned in May 1942 and did his second operational tour with Bomber Command. He joined 617 Squadron in 1944 and amongst other sorties flew three against the Tirpitz including that of 12th November 1944 after which the Tirpitz sank. Tony Iveson is Chairman of the Bomber Command Association. Flight Lieutenant Bob Knights D.S.O., D.F.C. 619, 617 Sqd. 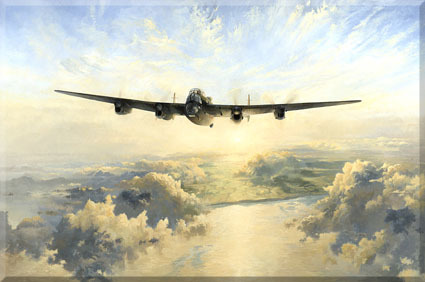 Bob Knights did a tour on Lancasters with 619 Squadron joining 617 Squadron " Dambusters" in January 1944. 617 had become a very high precision squadron championing the use of SABS stabilised automatic bomb sight. He dropped his first "Tallboy" 8/6/44 on the Saumur tunnel and later took part very successfully on the famous Tirpitz raid with Willie Tait as commander, 12/11/44. He was seconded to B.O.A.C. in December 1944. Immediately after the war he flew Lancastrians to Karachi. Later, throughout his long career he flew Yorks, Argonauts, Britannias, and spent ten years on VC 10s ending up as a captain on Boeing 747s. Just 50 Artist only signed copies left! 250 Artist only signed copies! The original painting in acrylics on canvas is available 20" x 30", fully framed.